Maybe whoever said not to talk about politics or religion in social conversation was on to something. Twice in as many days, I have read a string of comments and counter-comments on Facebook that have, in my estimation, amounted to a verbal spat. In both cases, the precipitating issue was political. I must confess that I have, on occasion, “vented” in my own Facebook status or in this blog about things political. I have also from time to time raised a question about someone’s strongly expressed opinion, just to pose another possibility. Mostly, though, I appreciate the uplifting and encouraging comments that I regularly read on Facebook–and I feel that a few minutes have been well-spent if I can be on the giving as well as receiving end of some each day. So, I was quite surprised at the vehemence bordering on meanness that came through in the “conversations” I observed. And I was grieved. In both cases, the “Facebook fights” I encountered appeared to have erupted over either a) a difference of opinion or b) a misunderstanding of what someone said. What do we do in face-to-face conversations when either of those situations occurs? If the goal is to be diplomatic or gracious or really to understand, we ask a question. In the news feed eruptions, instead of being asked a question, the commenter was jumped on verbally, and, most surprisingly to me, was the object of name-calling. I grieve because the “fights” were started and perpetuated by Christ-followers. I have no way of knowing if those to whom the counter-comments were directed were also Christ followers. But, I’m pretty sure Facebook fights are not an application of the Golden Rule or the command to love our neighbors. And, if it matters if we are winsome in matters political, we will never get there by ugly argumentation with our fellow travelers. Even in perilous times when the truth seems to be a rare commodity, we stand to gain more ground by speaking the truth in love to those who disagree with us than by screaming the truth at them in high-pitched voices. We live in troubled and troubling times. It’s putting people on edge. It’s sending some people over the edge. Some are lining up on the edge. Many are lining up on opposing edges. But, we need to seek not to let it make us edgy with each other. I grew up on a dairy farm (Holstein cows and John Deere tractors) in Branch County, Michigan. My little town of Litchfield (just over the line into Hillsdale County) didn’t–and still doesn’t–have a traffic light, just signs to help one navigate around the town park where M-49 and M-99 intersect. Is it any wonder that my hometown had an entity known as the Litchfield Farmers Club? I remember the night that picture was taken. I know it was hot, because I was a wearing a sleeveless dress that I’d gotten for my 10th birthday that June; that was the birthday my mom and I celebrated by attending the stage play of The Sound of Music at the Tibbetts Opera House in Coldwater, Michigan. I’ve not worn much yellow in my life, but I liked that dress, yellow checked with navy trim, and I wore it every chance I got. Either the IOOF Hall or the Municipal Hall above the fire station was the setting for the photograph. 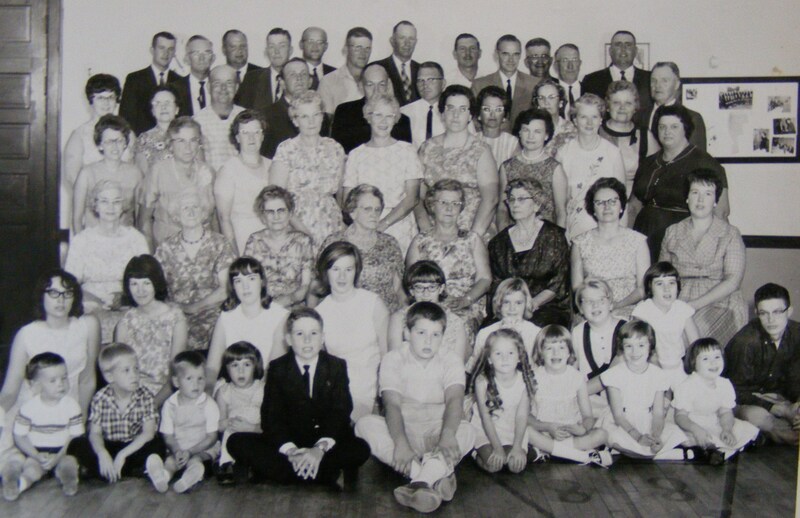 I know it was one of those two upstairs places in our town where, over the years, I attended a number of banquets and wedding receptions, since, other than the school gymnasiums and the youth center, those were the largest gathering places in Litchfield. As I look at the picture, it is in many ways like looking at a rolodex of names and places from my childhood. Even today, I can name just about everyone in the picture, tell you where they lived, and who their kids were. I’ve been at most of those people’s homes, since Farmers Club met monthly and the members took turns hosting the meetings. During the summer months, the meetings were on the first Friday evenings. During the winter months, when farmers’ schedules aren’t as demanding in the daytime since there are no crops to deal with, the group met for noonday dinner meetings on those first Fridays. So, when we were little, before we were in school, or if the first Friday happened to fall on a day off of school (as it often did on Christmas break) we got to go to those meetings with my mom and dad. (It was at one of those meetings that my brother Paul accidentally locked himself in somebody’s bathroom and had to be rescued.) I can picture the kitchen of just about every lady in the photo. My parents were one of the younger couples in Farmers Club, so a lot of the kids pictured there were in high school–they were the kids who rode the same school bus as we did but got to sit in the back, who played on the high school ball teams, and who marched in the band at every Memorial Day or Wonderama parade (“Wonderama” was our small town summer celebration–now they call it “Sweet Corn Days”). My uncle was a farmer too, so my cousins are seated near us in the photo as well. I point out to my son the Swedish couple, Gunnar and Astrid Enquist, who raised sheep, gave us orphan lambs to raise, and always let us stop by after Halloween trick-or-treating for a cup of hot chocolate and some ooh’s and ahh’s for our costumes. I see my first 4-H leader, Evelyn Evans; my favorite club meeting ever at her house was when we brought unusual foods to taste–I had my first exposure to okra and to pine nuts in her kitchen. I see Mr. and Mrs. Ferry whose name I always thought was cool (until I found out it wasn’t “Fairy”). Names like “CarlandClaraDawson” and “WoodrowandLoisSouthfield” roll off my tongue–they don’t click in my mind as anything but duos, people who came as a package deal. The names on the club roster were the last names of the 4-H members whose livestock projects occupied the stalls in the 4-H barns at the county fair each September. When I looked at that picture on Saturday, I realized that there are a lot of single, short threads in the weaving of my life that originate with that tapestry of people. When I visit my hometown now, I still pass some of those farmers’ farms. Some are now run by the second or third generation. Some aren’t farms any more. Most of the elders in the photo are dead, having faded one by one from the scene over the past dozen years. But, when I look at that picture, I still hear the laughter, still hear the singing that accompanied every Farmers Club meeting, still remember my mom and dad talking about what they would answer for the roll call question at that night’s get together, still can feel the warmth of caring and concern in that circle of friends united by the common bond of making things grow and caring for living creatures and producing goods that would nourish and supply many others outside of that circle. April showers bring May flowers. In this case, an April shower will bring a May wedding. My dear friend Kris and I spent a couple of hours on Wednesday discussing plans for a bridal shower we’re giving for the daughter of a mutual friend. It’s fun to think about how it will look, how it will feel, and how it will taste! I used to think bridal showers (or baby showers, for that matter–maybe we’ll be hosting one of those in a few years!) were mainly about gifts. But, the more I’ve attended them and the more I’ve even hosted a few, I’ve decided that’s not it at all–or at least not in the case of the best ones. The guest list for this particular shower is from the “friends”, as opposed to the “family”, list. These people are a circle of family friends, mainly from the bride’s church, as well as some from work–those two circles will intertwine at this party. Also included are the mothers of the bridesmaids–the friend circle ripples between generations. Then there is the new circle of friends, as immediate family (mothers/siblings of the bridal pair) are included and their closest friends are on the guest list–so the ripples intertwine as two separate pebbles are plunked into the pond of life. Kris and I are hosting this shower because our families have grown up together as we have shared the common life threads of homeschooling and of faith. I love being part of this weaving of a new piece of cloth.